Cloves of California Garlic are pickled and packed to capture their fresh, crisp taste. Our pickled garlic is available in seven flavors: Regular, Spicy, Jalapeño, Habañero, Mustard, Italian, and Smoke – be sure to try them all! Add to your favorite roasted chicken recipe or enjoy as a snack. Fantastic, especially when you are a garlic lover! I had these at a party. I was surprised at how good they were. I just ate them whole right out of the jar! on 11/12/2009 Spicy pickled garlic! Wonderful in salads or on their own! I'm not much on eating plain garlic , but when we tried the pickled reg. 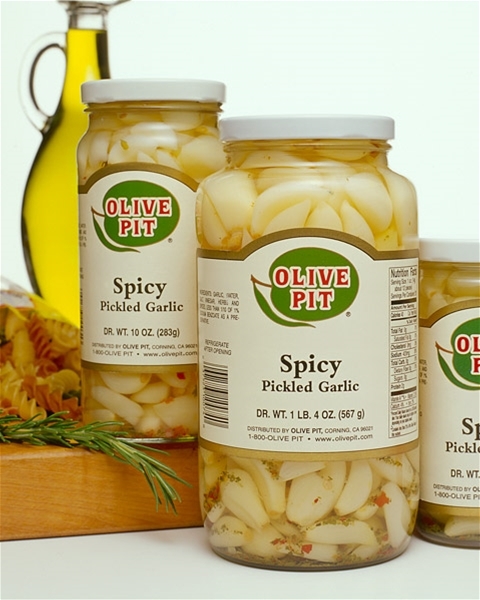 Garlic, I was surprised at the taste it had & did not have any problem asking for seconds.I was very unhappy when we finished the jar we bought in Corning,Ca., so we are about to get on the web site & order a few more jars. I'm sure these will make great Christmas snack gifts for friends and family. I will give the Olive Pit 3 thumps up if that's allowed..